Frank Kameny, a pioneer in the civil rights struggle for the LGBT community, died Tuesday at the age of 86. Dr. Kameny was an amazing human being. 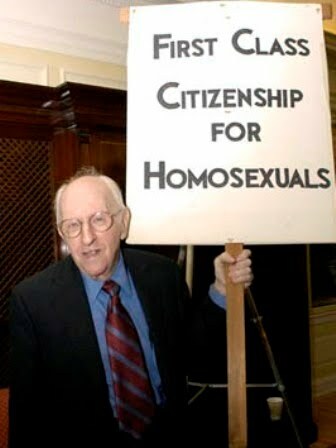 A World War II vet and a Harvard Ph.D in astronomy, he was fired from his job at the U.S. Army Map Service in 1957 because he was gay. So he sued the federal government, taking his case all the way to the Supreme Court. In 1961. He lost, but spent the rest of his life working for civil rights for the LGBT community. I can't tell you how grateful I am to this man and his cohort. Because of him, my Hot Daughter's Lesbianism isn't considered a "psychiatric disorder." Because of him, my Hot Daughter can live openly and honestly, not being forced to hide who she is on a fundamental level because the society in which she lives looks at her with disgust. Can you imagine how centered, how profoundly comfortable in his skin he must have been? When he sued the federal government, being gay was a psychiatric disorder, no one would admit to knowing someone who was gay, it was accepted practice in every community in the Union to denigrate, belittle and discriminate against its gay members. And yet Dr. Kameny stood up for himself. He was treated unfairly, so he did something about it, and then spent the rest of his life doing something about it. Gay is indeed good, Dr. Kameny. Fair winds and following seas - and thank you. I find that sort of self confidence to be really interesting. It really puts into stark contrast how so much of judgment and perception is from lack of confidence in oneself.